861 HAL is the famous ‘limbo dancing’ Dennis Loline II from the Barton fleet. It has an ultra lowbridge Northern Counties FL68F body and we see it at the Netley rally on 13 July 1986. How low can you go? Well, King Alfred’s WCG 104, Tiger Cub, is alongside – compare heights! Where does this Loline live now? A long-standing ambition is just to see it: riding on it would be the cherry on top. So much has been written about 861 that I apologise if I’m repeating what’s gone before but for those who may not know, this ultra low Loline was purchased specially by Bartons to pass under an ultra low railway bridge at Sawley Junction station (now renamed Long Eaton) This it did, just, but Bartons proved it could be done. However, the Traffic Commissioners were having none of it and refused to licence the intended route for double deck operation. 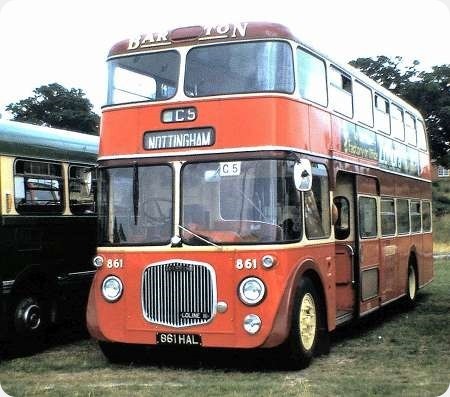 This left the company with a one-off vehicle with no real purpose but all was not lost for 861 because it became regularly employed on the X42 Nottingham – Derby express service where it put in some astonishing performances, up to 70 mph on the A52 road between the two cities. For most of it’s life it had a Leyland O.600 engine and also a regular driver too, a chap who was always immaculate in Barton’s brown uniform complete with striped shirt and bow tie, I never knew his name but he was known to everyone as ‘Flash Harry’ and a very competent driver he was. The X42 was jointly operated with Trent but those who knew and wanted an exhilarating ride chose Barton! Thanks, Chris and Ian. The PSVC listing for 2015 says 861 is part of the Barton collection, but I don’t know the location. A Wiki search gives me all sorts of museums, rare breeds farms and so on, but not what I’m actually seeking! This vehicle has become legendary, but I have never actually seen it. I don’t know if those alleged speeds are verifiable – the bus must have been very highly geared to get to 70 mph (I’ve got quite near to that in a 6LXCT powered Olympian). Nevertheless, I can vouch for the supreme stability of the Loline at high speeds, so 861 would have been entirely safe when motoring fast, especially so with such a low built body. 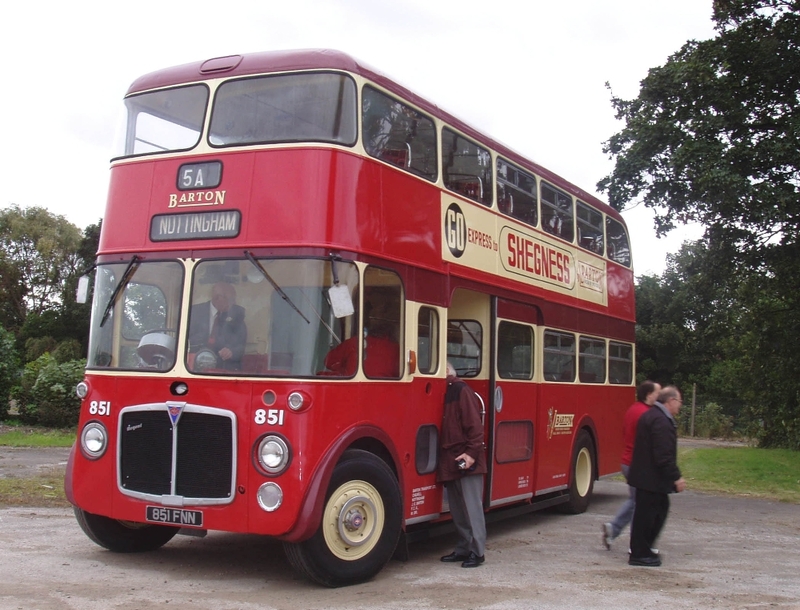 861 currently resides in its old depot at Chilwell, along with the other members of the Barton Collection. The premises are usually open to the public during the Heritage Weekend in September each year. Well worth a visit. It appeared as part of the Barton display at Showbus this year. I believe the Chilwell site has approval for redevelopment, but don’t know how that will affect the Barton collection. As presented in the Barton line-up at Showbus 2016. Given that the Loline was offered with a variety of engines, in this case the Leyland 0.600 being fitted, I’ve often wondered how 861 achieved such a low windscreen line together with what appears to be minimal engine intrusion beside the driver. It would seem to be much lower than, say, a Lowlander bonnet line or any other Lolines for that matter. For the technically minded, would the engine have been modified at all, or perhaps a shallower radiator fitted? Thanks for the info, gentlemen. I hadn’t realised that 861 was on the road, so I particularly regret not going to September’s Showbus—especially with all the other fascinating Barton vehicles there. To complement the ingenuity of the mechanical design and seating layout, everything about 861 looks well integrated: the very opposite of the afterthought-plastered-onto-afterthought appearance of some 1960s deckers. I take it, Roger, that the Regents weren’t ‘limbo dancers’ in the same was as the Loline – just broadly similar at first glance. If you compare the photos of other Loline 2s on this site, you can see that the radiator grille on 861 HAL is much lower, relative to the front wheels, than on other examples of the model. The clear recognition point between the Loline and the similar-looking Regents is the distance between the top of the wheelarch and the base of the windscreen and side window line. But both are classic versions of a pleasing design that hasn’t been bettered by the more recent use of economical flat glass for windscreens. The wrap-around look gave a real sense of style, in my opinion. And, of course, much better visibility than certain modern buses with heavy non-glazed corner panels. When 861 and Regents 850-4 were delivered they were fitted with the Cave Brown Cave heating system, so presumably they didn’t have a radiator in the conventional position. After only a few years, the CBC grilles disappeared, but it begs the question as to where the radiator is now. I remember one journey on 861 on the X42 with a new driver; I think he must have been used to the Regent Vs (four speed gearbox) as he never found fifth gear on the Loline for the whole journey! Fifth gear on the Loline I and II was engaged by pushing the stick forward from fourth into neutral, and then over to the right and back again in a ‘U’ movement. If the driver hadn’t been shown, he would probably never have found it. Changing back down from overdrive to fourth needed practice, too, to avoid engaging second gear by mistake. The trick was to move the stick forward into neutral and let it go, so that the detent spring could centre it properly, and then just pull it straight back into fourth. The curved front windows look natural on this bus and not out of place as they definitely do on the later Southdown Queen Mary Titans. This would seem to be the same procedure as I used to observe drivers doing in the Dennis Lances, Roger, if I’m not mistaken, as I travelled from/to Woking Station and St. Peter’s Hospital, Ottershaw. Roger Thanks for the explanation of finding fifth gear (and getting out of it again! ); is this similar to the 5 speed gearbox fitted to Bristol MWs? Whilst 850-4 and 861 had Cave-Browne-Cave equipment when new 957-62 did not and the radiators of tin-front buses were generally a lot smaller than the 1940s -style exposed items. I recall that unlike some Northern Counties full front bodies the regents did not use the manufacturer’s bonnet pressings. Perhaps the owner of one of the preserved examples could comment further. In answer to Chris H, the Dennis ‘O’ type gearbox fitted to the Lancet, Lance and Lancet UF (though the few LU4 late examples had the Meadows gearbox) worked the ‘wrong way round’ from right to left, and was essentially a four speed sliding mesh (i.e. true ‘crash’) unit with a preselective overdrive on the end of it. To engage fifth the gear stick had to be pushed from the fourth position over to the left and forward. Unlike me, OBP contributor Ian Thompson has driven Dennis machines with this unique box, so he is our ‘in house’ expert here. The Bristol box, Bob, as fitted to the LS and MW, was a synchromesh unit working conventionally upwards from left to right, and I do have experience of it. Fifth gear was engaged from the fourth position by moving it to the right and forward. It was thus impossible to engage/disengage fifth except though fourth, which meant much labouring of the stick to get going again if one was baulked in overdrive. The Lodekka had the same gear positions, but in that case the gearbox was a constant mesh affair, making the extrication process from overdrive rather more difficult. Generally speaking, Lodekka drivers seemed very reluctant to use fifth in service unless a clear stretch of open road beckoned. By contrast, all versions of the Loline (the Loline III had a gear selector layout similar to the Reliance) allowed immediate access to neutral and the other gears from the fifth gear slot, and fifth was treated as the normal top gear. This feature alone meant that the Loline was a more sprightly machine on the road than the Lodekka. Thx, Roger, for explaining much more about these gearboxes and that the ‘O’ was different from the Loline. You can quite see that drivers put on these vehicles without any advice, would have difficulty finding overdrive, or, if inexperienced, preferred the simplicity of avoiding it! One endearing thing about Dennis is that they don’t sheepishly follow the crowd. As Roger’s link to Ted Gamblin’s piece makes clear, changing into and out of the Maybach-designed overdrive on the Dennis "O"-type box is simplicity itself, whereas the other gears need rather precise timing. With the strange two-shaft box of the Loline I and II, on the other hand, you can hardly go wrong with any upward or downward changes, EXCEPT for the change down from fifth into fourth, which needs care not only in locating fourth properly in the gate, as Roger points out, but also in engine-speed matching. Having to go through first to engage and disengage reverse can also take you by surprise! I may be over-generalising here, since the only Loline I I’ve ever driven is ex-A&D 357, currently out of action with gearbox problems. It’s interesting that despite (or thanks to?) Dennis’s history of experimental and sometimes eccentric design, and their near-disappearance from the PSV market on several occasions, the company in its present form continues to thrive. Good that they escaped Leyland’s clutches! With BartoN Transport Ltd family and employees we had somewhat different names for the vehicles than what the spotters and enthusiasts call them nowadays. For example the full fronted AEC regents were known as Derby Deckers nothing else, all the ex Londons were London Deckers the 30 foot AEC 470 saloon were known as Reliance (which they were) but the 590s were known as 36 footers. Any thing with a PD1 or PD2 engine was known as just that, we never used Tiger or Titan, or what the chassis originally was. A Vuemaster was that and only that regardless of what it was made from, body names like Vista and Vega were never used. The moggy pickup trucks were vans, the AECs with 3 seats one side and two the other were Jumbos. The driver of 861 on the x42 Derby/Nottm express was Harry Bell or ding dong as we used to call him. His opposite was Ken Gardener also very smart with a dicky bow. I recall this very well as I used to drive 861 on a Saturday which was their day off. I drove 861 the Loline on Saturdays overtime I was out the garage, worked on it a lot and went out to it on breakdowns, not everyone’s cup of tea. On Saturdays Red Michael the Russian conductor would sit at the back looking for police cars and I could do 70mph if not more he managed to get a drink each end Notts and Derby it was on the non stop Derby express, we were never late. If 861 did 70mph then fully laden it must have been very sluggish as the gearing must have been high. Quite so Roger, the engine would be seriosly over revving to do 70mph, so if Bill saw this speed on the clock either it was over reading or it was in kilometres per hour (44 mph). Why would Dennis calibrate speeds in kph? I think Bill would know his 44’s from his 70’s! Some Barton buses used to make a lovely chuffing noise when "cruising" which I always used to think was their valves happily bouncing? Having ridden in 861 during the 90’s. including a London to Brighton trip, out of Chilwell depot. It was a fast motor. The only problem was the steering judder. It meant we had to change drivers ever hour My dad Bill Mann was one of the team that saved it and helped bring it back to life. I think Bill Redfern might have been driving the bull that winched us up the pit at the depot. On 1st October 1969 the Corporation bus fleets of Birmingham, West Bromwich, Walsall and Wolverhampton were absorbed into the newly formed West Midlands Passenger Transport Executive. Due largely to the famously eclectic tastes of its innovative and renowned former General Manager, Mr. R. Edgley Cox, members of the Walsall fleet were varied and interesting, if not (in my opinion) always very attractive. This photo of a former Walsall bus was taken in late 1970 on an enthusiasts’ visit. 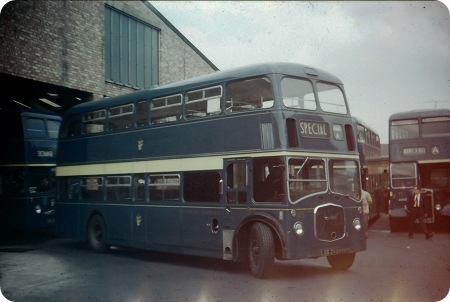 It shows a Dennis Loline II with Willowbrook H44/30F body, new in 1960. Walsall buses are intriguing. Always seems to be great attention to detail. I remember being struck by them when visiting for a job in the 60s. I assume that the 3 indentations on the front upper corner are accidental, but what is the cowl or cover above the bonnet/radiator on the nearside front and the access flap around the corner on the nearside? Did Mr Cave Brown Cave have a competitor? Dennis used completely different chassis designations for the Loline I and II in comparison with the later Loline III. Although the sales literature originally included the Dennis 8 litre 120 bhp engine as an option, in practice no Lolines were built with this power plant. Corrections and additions to the notes below would be welcome. Y1 This was used for all Loline I models, 30ft long with rear entrances and conventionally sprung rear axles. The two for Leigh were powered by Gardner 6LX engines, but all others had the 6LW engine. The biggest batch went to Aldershot and District who specified the five speed gearbox, which was the standard fitment. Those for Leigh, Lancashire United and Middlesborough had four speed gearboxes. YF1 All Loline IIs were 30ft long except where shown otherwise. The ‘F’ indicated front entrance. Designation YF1 was applied to the Walsall example 600 DDH that was effectively the Loline II prototype. It had a Gardner 6LW engine, a Dennis (five speed?) constant mesh gearbox and a conventionally sprung rear axle. YF2 The production Walsall model, similar in specification to the prototype, but this, and all subsequent Loline IIs, had air suspension for the rear axle. YF3 North Western batch with Leyland O600 engine and Dennis (five speed?) gearbox. YF4 As YF3, but with de-rated Gardner 6LX engine (some sources suggest that the engine was the 6LW, but Dennis expert Robin Hannay confirms the 6LX). YF5 Version for Luton, 27ft 8ins long with Leyland O600 engine and Dennis four speed gearbox. YF6 The Middlesborough batch, Gardner 6LW engine and four speed gearbox. YF7 These City of Oxford buses were 27ft 8ins long and were powered by AEC AV 470 engines through five speed gearboxes. YF8 Not used. Was it a cancelled order, perhaps? YF9 This emerged as the Loline III demonstrator, EPG 179B, with the new chassis designation L3AF1E1. Powered by a Gardner 6LX engine through a four speed semi automatic SCG gearbox, it was originally intended for the China Motor Bus Company, but it has been said that it never got there for reasons that are still obscure. YF10 The final Walsall machine, shown in John’s picture above, was given this designation, though the differences from the earlier batch are unclear. YF11 This is the very well known, unique, lowbridge Barton machine, equipped with a Leyland O600 engine and a five speed gearbox. In later life it suffered the supreme indignity of being fitted with an AEC radiator grille of the Regent Mk V variety. I believe (and fervently hope) that this injustice has since been righted in preservation. The first two production Loline III buses went to Leigh Corporation, and, because these were of rear entrance layout, Dennis rather surprisingly gave them the chassis designation Y2 consistent with the early Y1 Mark I series. All other Loline IIIs had front entrances and were given L3 type chassis codes. The Loline came a bit late really if Dennis had got the licence to build the Lodekka under the name of the Loline sooner I’m sure there would of been a lot more of them than there was. 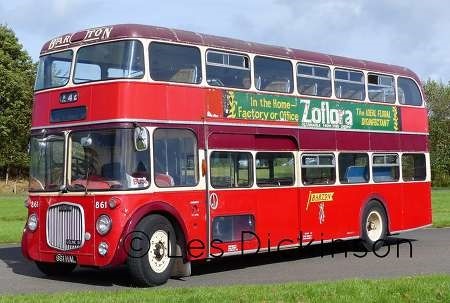 Unfortunately for the Loline in fact for any front engine bus the rear engine buses that soon followed it could have highbridge seating in a lowbridge body due to not having to have drive shafts etc from front to back. If your a fan of rear engine buses I’m afraid I don’t have many all a bit boxy for me. This bus by the way had a sliding door rather than the more usual collapsing type a good picture that shows the other side of this type of bus is here. There were nine of these Loline mark IIs bought by Middlesbrough Corporation in 1960-1961 following the successful introduction of the solitary mark I JDC 599. The mark II was different in having a front entrance with a chassis modified to accommodate it. 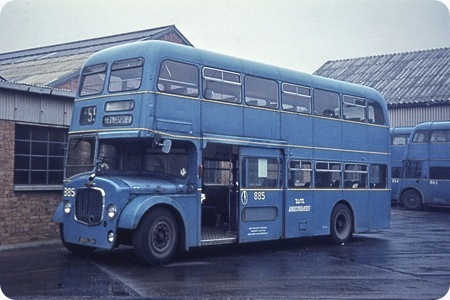 On the Northern Counties body, fitted to the Middlesbrough batch, the passenger doors were air operated by a long lever and there are many tales locally of passengers getting shopping bags etc caught by the door. The advent of the Daimler Fleetline ensured that no more Lolines were purchased and the low height version of the Fleetline became the standard vehicle from 1962. These were suitable for the low rail bridges of which there were two in Middlesbrough. All buses passing under them had to be less than 13’6” tall. As a safety measure, buses that complied were fitted with white steering wheels while normal height buses had black.